Standing in a bookshop behind the man from the Guardian drinking wine from a plastic cup listening to a handful of local performers doing their thing on a tiny stage. As with so many things I brought it on myself. Not only did I allow the thought: "Hmmm, what a lot of nice, reasonable people I've been dealing with lately" enter my conscious mind but I forgot to turn my phone off at five and picked up the call that came through at five past. When the answer I gave him didn't tally with the answer he wanted me to give him (and following a lively exchange of views culminating in him resorting to calling me "Dear"- you know they're on the ropes at that point) he demanded to speak to ExLineManager. Presumably in the mistaken belief that this would intimidate me into changing my answer (the correct one) into his answer (the incorrect one). It didn't. I sometimes wonder why I bother. What does it matter anyway? Why can't I just agree? I could say: "Oh, you know, now I've had another think, yes, the law is exactly the opposite of what I just said it was. Turns out you're 100% right! I don't know why you bothered asking me in the first place! What do I know about it?" After all it's no skin off my nose is it? I'm not going to be the one wasting money on court fees. In fact, if he rings back tomorrow, I think that's exactly what I will do. I think we've all got our fingers crossed for Thursday. Dreading it being an elaborate hoax on his part: "Ha Ha, fooled you! I'm going nowhere!" And, then, he might not get it. Or, worse, he might get it but not take it. "...while my head spins, and you knew it would"
I don't know if I'm really allowed to say this or not but, MyOwnTrueLove and I met through the NME personal ads. I think it's romantic but he's always kept a bit ... well ... quiet ... about it. Before we ever met I knew we had a pretty good chance of 'hitting it off' due to the judicious exchange of compilation tapes that had supplemented the letters and...phone calls. One track from his first offering (The Lilac Time - 'Love Becomes A Savage') has since become so essential to my life that I hardly ever stop to think back to that pivotal "Who is this?" moment when I first became aware of it's existence. Then, a couple of weeks ago, I stumbled across Sinead O'Connor's 'Troy' via Spotify. This one I remembered, but hadn't heard in years. And yes - the hairs on the back of my neck still stand up. Also on there was 'Black and Blue' by Johnny Dangerously, a track I've spent this week YouTubing and crossing my fingers that John Bramwell will be performing when we see him in Lancaster in May. Looking back: how could I have failed to have been pre-seduced? Other people's noise in my head. Used Guy Garvey to block it out at lunchtime. When ExLineManager asked if I'd go undercover for him - and once I'd established that there were no strings and no commitment would be required - I agreed pretty sharpish. It's been a while since I did anything even vaguely double-entendreish in the workplace and you need to grab your fun where you can. Providing he doesn't lose his nerve there'll be more fun on Friday, when he mischievously slaps a fixed penalty notice on the new boss. First thing I did yesterday morning was write "LIBRARY" on a post-it note to stick to my monitor, to remind me to go to the library on the way home. Later on, in the afternoon, I wrote "LIBRARY" on my hand, so as not to forget to go to the library on my way home. Yesterday evening: I went to the library on my way home. Sometimes things go exactly according to plan. Before I get into work there's this one thing that everyone should know: I'd really rather you didn't ask about Easter. Asking may oblige me to tell and, I promise, you don't want to know. The worst thing about it is that she brings out my inner fourteen year old - all sulks and sublimation and righteous indignation. The best thing is the discovery that the '24 hour' allergy pills I bought by mistake instead of the ‘one every four hour’ ones are really effective. Not that I was having trouble with an allergy, as such, but I discovered that they leave me feeling serene and distanced and slightly numb. Magic. My regret? That I can never go back to the magical place that was: not knowing anything at all about "Doc Martin". Or UnclePaul'sMum's bladder cancer. 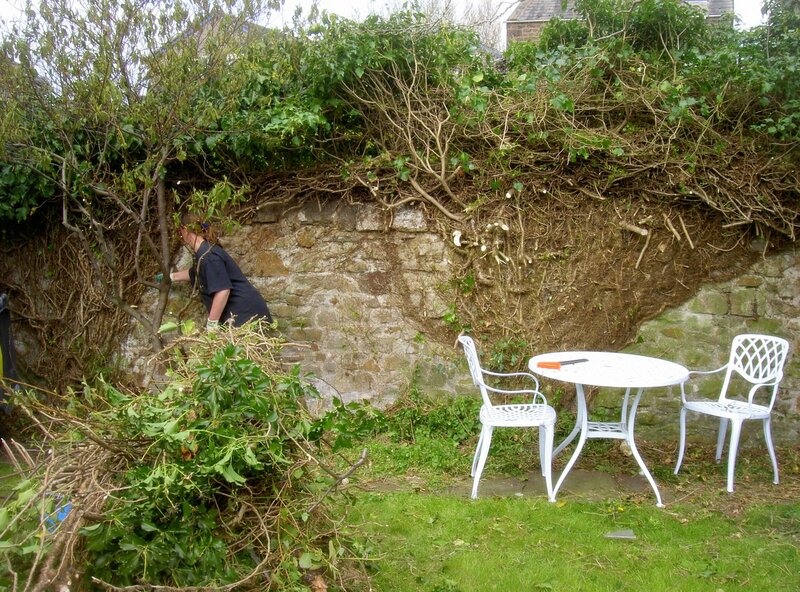 Hacking back that ivy was very satisfying though. "...but my only desire is to be recognized ... by you"
This has been a crap week work wise. Nothing bad has happened. I'm on top of my 'caseload'. I've had some nice chats with some nice people who I'll never, ever have to meet face to face. GirlieBoss has been off all week. ExLineManager gave us each a tube of mini eggs. The trains were on time (mostly). Plus it's a four day week - what more do you want? Just....I don't know...some vague hope that, one day, things might be...well, less crap? It's only what we were promised, after all. The man who stands outside the halls of residence in the morning, leaning on a shovel and watching the trains go by, was standing outside the halls of residence watching the trains go by with a small child perched on his shoulders this afternoon. It must be 'take your toddler to work' day. It seems that dentists, generally, are not very highly regarded. My experience of them hasn't been all bad. I've had a couple whose opinion I valued and whose verdicts I trusted. Not for some considerable time though. Yesterday's appointment was at 16.45. I arrived at the surgery just before twenty to and, after a couple of minutes wait, was called in. By 16.45 I found myself standing at the reception hatch forking out £16.20 and wondering what just happened??? What had happened was that I'd had a 'gum check up'. This consisted of the TwelveYearOldAllegedDentist sticking a sharp object into my gums, in a couple of places, and then announcing that I needed to come back next week "for a full examination". I did remonstrate, believe me. Questions such as "Why can't you do it now?" were met by a perplexed stare. The hygienist spoke for him "It can take up to half an hour". Fair enough, but by my reckoning I've still got fifteen minutes left on this appointment, so why don't we make a start now and see how far we get? But no, for reasons I still don't fully understand, it doesn't work like that. I'm supposed to go back next week. Because I haven't changed dentists since moving house it's all a bit of a trek. What with the trains and everything the trip from work, to dentist, then home took four and a half hours. I'm not going back next week. What's the worst that can happen?